Sorry for more Italian but I’ve been on a roll lately and couldn’t resist making Pollo alla Milanese this week. Cheryl’s been swamped at work and this is one of her favorites. It’s also her birthday week so I thought this would be a nice weeknight dinner to prepare for her. That and pollo alla Milanese is simple, simple, simple to make. And what do we know about simple things in life? They’re usually pretty damn tasty and this is no exception. Whenever you see something on a menu described as ‘Milanese’ style you should know it’s going to come out breaded. From what I can remember from my Italian lessons, the ‘vestito’ part means ‘dressed’ which is usually just a simple addition of arugula and tomatoes, thereby dressing up your cutlet. The photo above is pretty much what you’ll see in any Milan osteria or trattoria when you order veal, pork, or chicken Milanese vestito. There is usually a plain option available but who wants just a breaded cutlet on a plate? Not me, the arugula and tomatoes work really well with the breaded fried cutlet. Peppery arugula, a little sweetness from the tomatoes, crispy fried bread crumb texture giving way to seasoned chicken. Mmm. Squeeze a lemon wedge over the dish for some citrusy acid and you’ve got a meat course which is satisfying yet not overfilling, leaving enough room for la dolce! Pollo alla Milanese does require a kitchen essential: one of those mallet tenderizers to beat and flatten your chicken. They’re not expensive and you can probably find one in the grocery store aisle where they have the kitchen utensils. Of course you can probably just buy chicken cutlets but you’ll likely pay more for them per pound than flattening them out yourself. Besides, using the mallet is a good stress reliever. I find the key to preparing anything breaded and fried is keeping the oil fresh and not crowding the pan, as it will cool your oil. I’ll fry a cutlet, drain off any remaining oil, wipe out the pan and start over with more oil. If you keep using the same oil any little bits left in the pan will eventually char and your cutlets will absorb that flavor from the oil. I also like using panko bread crumbs because I think they stay crispier than regular bread crumbs. The simplicity of pollo alla Milanese and the small amount of time needed to prepare it makes this dish a perfect candidate for a quick weeknight dinner as well. And as a bonus, if there are any leftovers (fat chance) the chicken cutlets can be used to make a chicken parm sandwich for lunch the next day. Oh and in case you were wondering, Cheryl was very happy when she came home late from work and saw I’d made this for her! Place a chicken breast flat on your cutting board. Carefully slice it in half from the fat end to the pointy end so it looks like two pieces of bread. Repeat with the second breast. You now have 4 pieces of chicken. Set aside on a plate and continue with the other three. Pour some flour on a plate for dredging. Pour some bread crumbs on a separate plate. Add a ¼ C (could be more, could be less depending on the size of your pan) of olive oil to a pan and heat on the stove top over medium-high. You want to get the oil hot so the cutlets don’t get all greasy. Side Roam: How do you know when the oil is ready? I take a small piece of the chicken (there will always be a small piece or two when you make this) and drop it in to see if the oil starts to sizzle. Some other tricks are: put a piece of popcorn in the pan, when it pops the oil is ready; and, dip the end of your wooden spoon into the oil, if bubble form around the end and rise up the oil is ready. Salt the cutlet and dredge the salted cutlet in flour. Dip the salted, floured cutlet into the egg mixture and flip around making sure to coat both sides. Dredge the cutlet in the bread crumbs making sure to coat the entire piece, lightly shake off excess crumbs. Place cutlet in pan and fry for about 1-2 minutes (depending on how thick your cutlets are). Flip over and fry the other side. Remove from pan and set aside to drain on a paper towel lined baking sheet or rack. Season with a small pinch of salt while still hot. As always with cooking, use your senses. Watch the cutlet, you’ll notice it’s the color of the chicken change as it cooks. When it looks like it’s reached about halfway up, flip it. Pay attention to the aroma, starting to smell burning bread crumbs? You’ve left it too long. The first cutlet I do always, ALWAYS, ends up less golden brown than the following. It’s a lot like the first pancake when making pancakes; fine but not perfect. The last one I do usually ends up more golden than the middle ones. The middle ones are always Goldilocks perfect because the heat always seems to be just right for them. There shouldn’t be much oil left in the pan as the bread crumbs do absorb some. Wipe out any crumbs from the pan, add more oil and repeat the dredging, frying process for the remaining pieces. When all the cutlets are finished, plate one, cover with arugula and halved cherry tomatoes. Squeeze a lemon wedge over the cutlet and serve. Love it. Milanese is probably the favorite recipe of my family. This one looks great. Thanks! So easy to make, so delicious. Lovely recipe and photo. Did you know that Chicago is typo’d in your header?!! Thanks! Ha, I thought something looked funny about it but couldn’t figure out what. Fixed! Proofreading dept is going to get yelled at. LOL, oh my goodness this is the same recipe I posted to my blog today! (I schedule my posts out in advance.) I see you posted this a few days ago but I catch up on the blogs I follow once a week on Mondays. 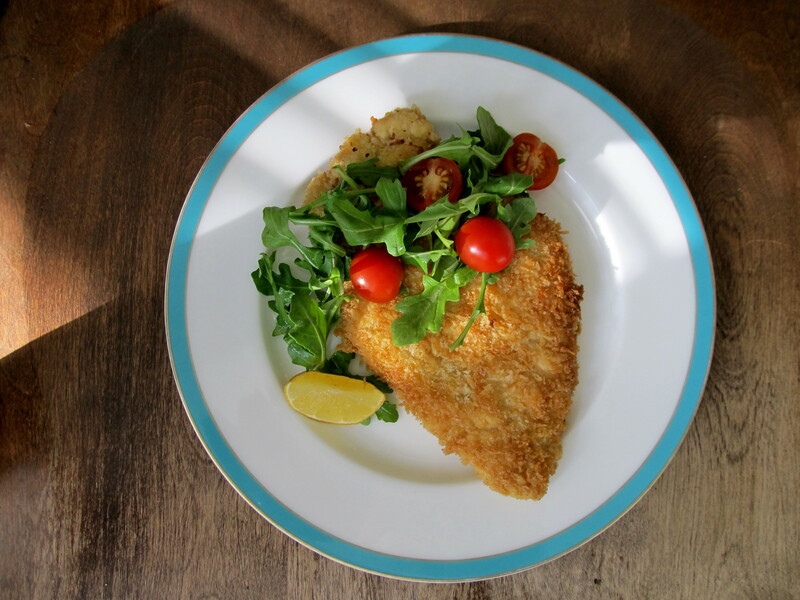 I made chicken milanese spicy for guests that came to.visit. It really is a fun, tasty and simple.dish to make. A sure croud pleaser! Love this dish! Ha! I know, I saw! Great minds, right?